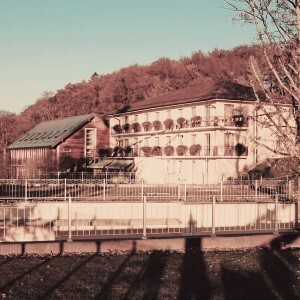 Standing majestically on a 70-acre plot of land in Ulverston, Cumbria in North West England, Manjushri Kadampa Meditation Centre (MKMC) serves not only as a contemporary temple and an internationally renowned centre for meditation but also as the headquarters of the New Kadampa Tradition (NKT). 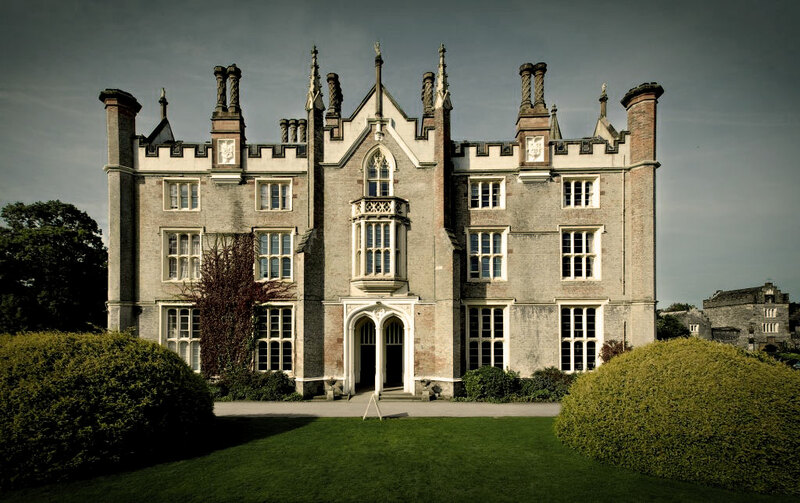 The main building is Conishead Priory, an English heritage landmark with Gothic-style architecture. 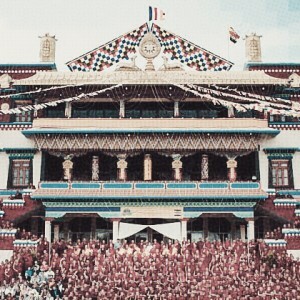 Founded by Venerable Geshe Kelsang Gyatso, the NKT is the largest Tibetan Buddhist-based organisation in the world today. 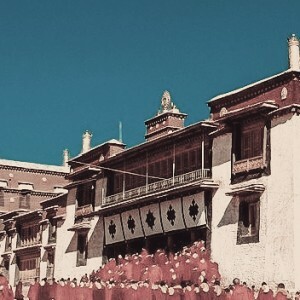 Geshe Kelsang Gyatso was one of the pioneering Tibetan Buddhist lamas who were instrumental in introducing and spreading the pure tradition of Mahayana Buddhism based on the teachings of Lama Tsongkhapa to the West. The square base on the lowest level of the temple with a door on each side, symbolising the four ways of entering the path of liberation. 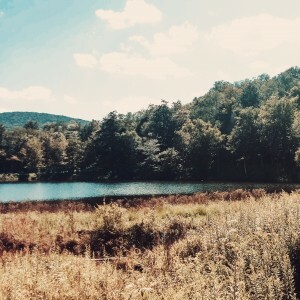 It is also a reminder that living a spiritual life is the only avenue to true and permanent freedom from suffering. 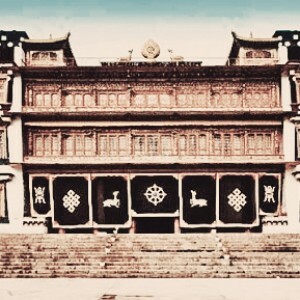 A Dharma wheel with a male and female deer on each side placed above each doorway. This represents the final stages of the spiritual path to Enlightenment. 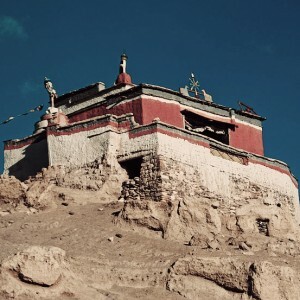 The next level of the temple features an octagonal structure with a lantern tower topped by a golden five-pronged vajra. It represents the five wisdoms of an enlightened being. 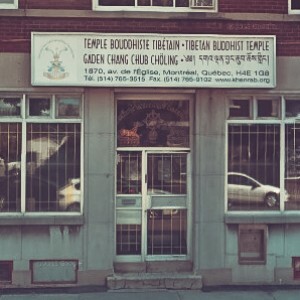 Other vajras placed on the corners of the building reflect the indestructible qualities of an enlightened mind. Precious materials adorn the temple structure, such as the gold-leafed roof of the lantern tower and the gold-impregnated glass windows which showcase the preciousness of the Buddha’s teachings, especially when put into practice. The application of many auspicious symbols on the temple walls mimic the Pure Lands of the enlightened beings. These invoke blessings and bring peace of mind. Manjushri Kadampa Meditation Centre is home to the largest bronze Buddha Shakyamuni statue in the West, which presides over the main altar of the temple. To either side are statues of Buddha Maitreya, embodying the enlightened mind and Buddha Manjushri, embodying enlightened wisdom. 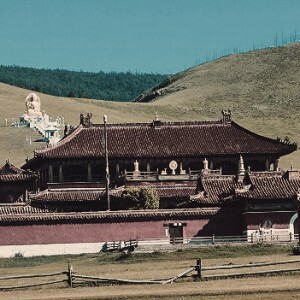 Magnificent statues of Lama Tsongkhapa and his two heart disciples are featured on the far left. 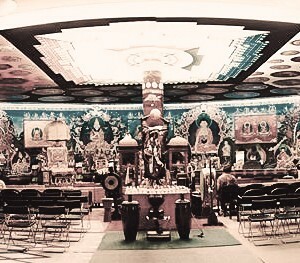 A grand Protector altar on the far right features the five different emanations of Dharmapala Dorje Shugden. 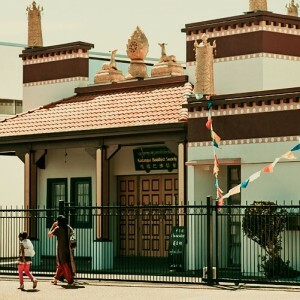 The centre is well equipped with all the necessary facilities including extensive accommodation for residents and guests, a dining area, World Peace cafe, communal spaces, and even a gift shop, where Buddhist art, statues and practice supplies can be purchased. 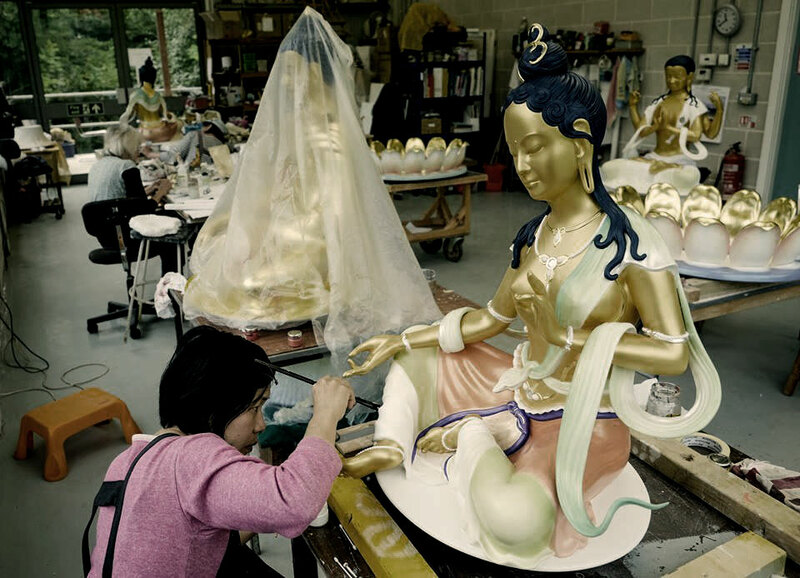 Art-related activities particularly the creation of Buddha statues and Buddhist art conducted by the in-house art department, known as The Kadampa Art Studio. A Teacher Training Programme which aims to train aspiring individuals to become Dharma teachers to help Dharma flourish internationally. 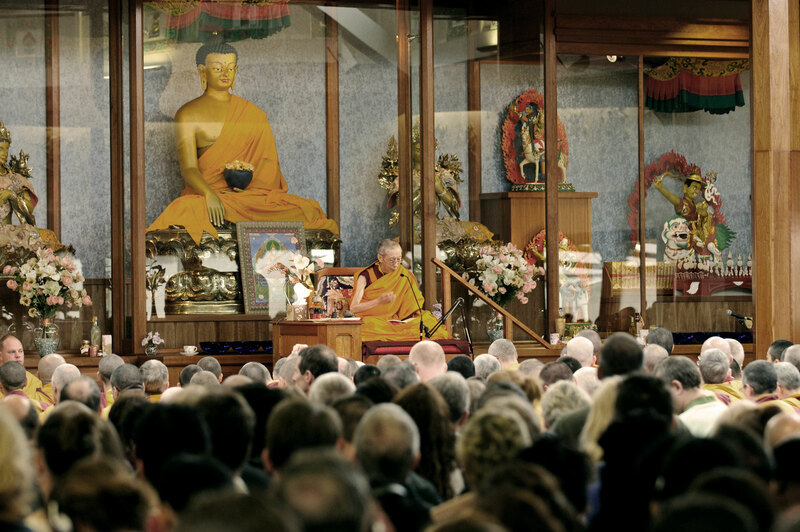 This in-depth programme of study and practice also includes practical teaching experience in the centre, its branches or affiliated Kadampa temples. A structured volunteer program which offers a choice of other activities including cleaning, cooking, gardening, and more. 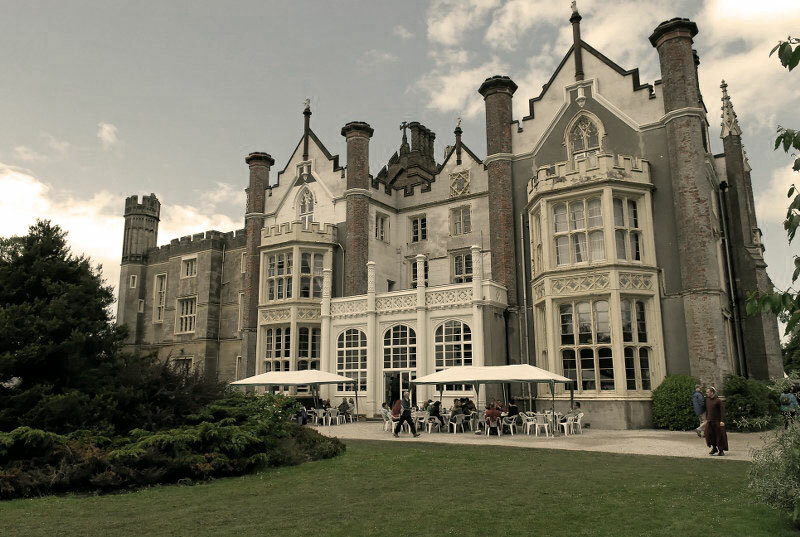 The World Peace Cafe is located in the sunny conservatory of Conishead Priory. It is open to the public and serves a selection of teas, coffees, soups and baked goods. Manjushri Kadampa Meditation Centre looks really impressive and stately. I’m sure they are doing good works there. As stated in the article, Geshe Kelsang Gyatso has given numerous teachings there. They even have teacher training program and volunteer training program. 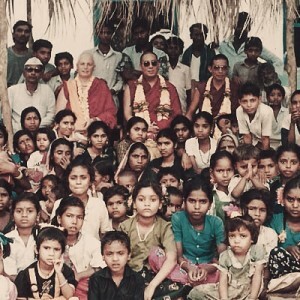 They have meditation and retreat courses and other dharmic activities at the centre. It’s lovely to see the many big statues being painted at the art studio. And, it even have a cafe to serve hot beverages and baked goods. It sounds like a very well planned centre with great activities. May Manjushri Kadampa Meditation Centre continue to grow and bring more dharma dn benefits to more people. Wow, Manjushri Kadampa Meditation Centre is a beautiful majestic tribute to their Guru, Venerable Geshe Kelsang Gyatso. 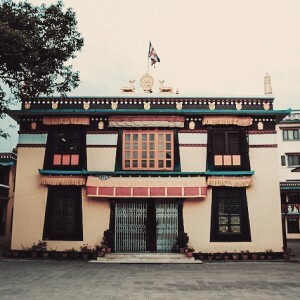 The charm of the English and the mystic of the Tibetan combined to offer such an impressive and peaceful centre of activities for the followers and practitioners. I especially love the altars with all the Buddhas encased in gold gilded glass. 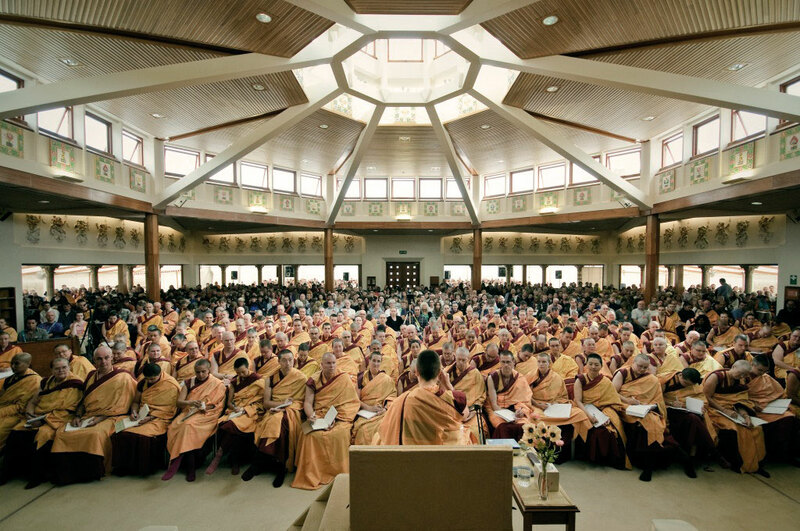 As we can see from the picture, Venerable Geshe Kelsang Gyatso teaches to a room full of devoted students. I like that room as it offers such an openness that all the students are able to see their Guru. May Venerable Geshe Kelsang Gyatso live very long to continue turning the Wheel of the Dharma and precious Lama Tsongkapa teachings. May his centre activities grow to benefit all those who seek the peace within. 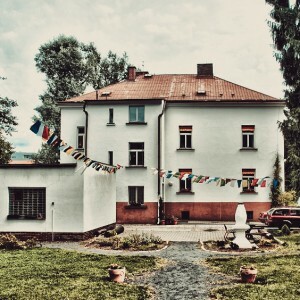 Truly rejoice to read about the majestic Manjushri Kadampa Meditation Centre (MKMC) that serves as a contemporary temple, a renowned meditation centre for meditation, as well as the headquarters of the New Kadampa Tradition (NKT) in the west. 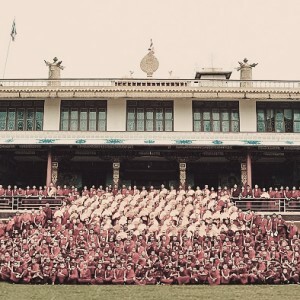 The main objective of MKMC is to spread the pure teaching of Lama Tsongkhapa to the world. The founder, Venerable Geshe Kelsang Gyatso, has given countless Dharma teachings and empowerments in MKMC. The centre is featured to be well-equipped with good facilities; i.e. 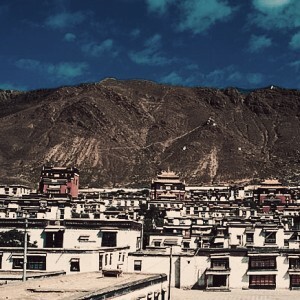 accommodation for residents and guests, dining area, cafe, communal spaces, and even a gift shop, where Buddhist art, statues and practice supplies can be purchased. 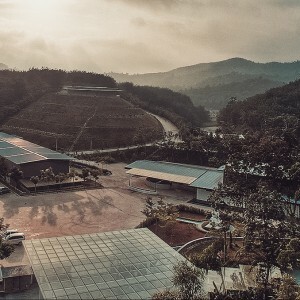 I find the setting of MKMC is very similar to Kechara Forest Retreat. This goes to show erudite lamas who are pure and genuine have common goal which is to provide the best platform to share and spread pure Buddha’s teaching that benefit all sentient beings. Thank you for this wonderful article. How wonderful when Kechara Forest Retreat expand and grow as beautiful as Manjushri Kadamapa Meditation Centre. Its a good example for us to make the centre well organise with great activities. We must learn from them. Thank you for sharing Rinpoche. 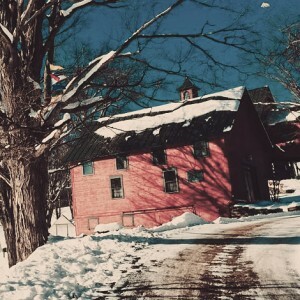 Thank you for sharing this beautiful buddhist centre, Manjushri Kadampa Meditation Centre. 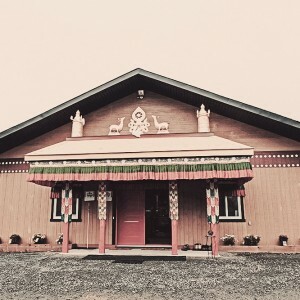 Most of the centres are well equipped with all the necessary facilities to benefit the people have comfortable place to listen dharma and practice. May the founder of NKT, Venerable Geshe Kelsang Gyatso, has stable health and long life and continue benefit to many others by turning the dharma wheel.